Bullying is a game when some children abuse their power. 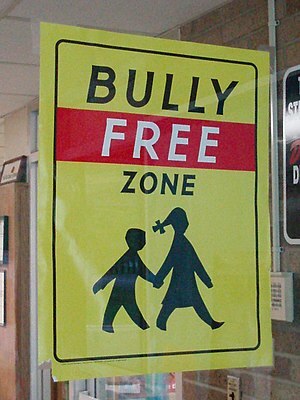 The target or the person that is being bullied can stop getting hurt by blocking the bullying. This can be by removing oneself or by becoming detached. So, how does the game of bullying work? Well, there are some rules to this game. I will follow up on these rules in my next blog. This type of bullying involves the attack of someone who is weaker. This doesn’t just happen in a school setting, it occurs in the workplace as well. It can be directly aggressive such as hitting, kicking, spitting or indirect such as by gesture, suggestions, stalking and defacing or hiding of property. So if you notice a family member coming home with ripped clothes for example, stay alert and mindful of their behaviour as this type of bullying could be happening. Some specific examples of physical bullying include: pushing, kicking, hitting, bumping, hair pulling, tripping pulling the chair out just as someone is about to sit down flicking water, paper etc locking them in a cupboard or the toilets throwing belongings around the room interfering with someones belongings in their locker or desk damaging clothes stealing their lunch or things from their desk or bag I’m feeling distressed just at the thought of this type of behaviour. Do you have any thoughts? As always, your thoughts and comments are most welcome.